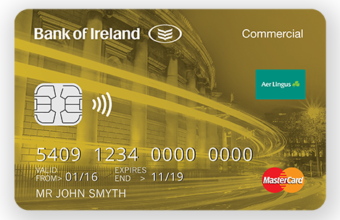 A Bank of Ireland Business Credit Card is an essential tool for your business offering you control, simplicity and certainty. The Gold Business Credit Card is suitable for any business person who travels and is an ideal expense management tool for all types of businesses. Interest-free credit: Enjoy up to 37 days’ interest-free credit on purchases. Pay in full each month by direct debit and you can avoid paying interest charges. Receive 24/7 real-time alerts whenever spending goes above the limits you’ve set. Track what you spend: Tracking your business spending is easier using your detailed monthly cardholder statements. By separating business and personal expenses, a credit card makes expense reconciliation quicker. And there’s no need to pay for business-related expenses on personal credit cards or carry large amounts of cash. Gold Card Business Online: You have access to a new web based transaction management system, which lets you manage all your expenses online. You can access e-statements anytime. And businesses can track and run online reports analysing spend either by individual or by retailer. See below the Gold Card Business online registration process/ demo. Worldwide acceptance: Remember your card is accepted worldwide in over 36 million locations so you can rely on it when you are abroad. Contactless payments: Make purchases up to €30 by simply holding your credit card against the card reader – ideal for quick purchases when you’re on the move. Comprehensive travel insurance: You and up to 3 colleagues are covered for 90 days of any journey when you pay for at least 50% of your fare with your credit card. Travel Insurance is provided by Bank of Ireland. Bank of Ireland is regulated by the Central Bank of Ireland. The Travel Insurance cover is underwritten by AIG Europe Limited. AIG Europe Limited is authorised by the Prudential Regulation Authority of the United Kingdom and is regulated by the Central Bank of Ireland for conduct of business rules. Chargeback rights: You are protected when you use your credit card to make purchases in the event of loss or non-receipt of goods or services and in the event of fraud. Flexible options: You can have an unlimited number of cards per account, set individual credit limits for each business credit card and choose from a range of monthly payment dates to suit your cash-flow. Reduce Bank charges and transaction fees by using your Business Credit Card for purchases instead of writing cheques, etc. 1 Bank of Ireland is not responsible for information on third party websites. If you need to speak directly to an agent, please use our dedicated credit card lines.